It is, now, almost seven years since I set aside my watercolours and brushes to better concentrate on my first great love, film/video-making. I had reached a crossroads in my painting, the culmination of a series of events with their roots in the 1960's, when I had been a design-draughtsman/technical illustrator for a major home-appliance manufacturer. I had begun my career, (such as turned out to be), as an artist, under a huge disadvantage, that of being a too-meticulous worker, a legacy from the days when a wall-chart, listing the spare-parts for a major item of whiteware, might well have taken me six weeks or more of painstaking effort. For that reason, I could never escape 'tightness' in watercolour execution, despite the fact that I had no such problem with oils. However, it was watercolours, which interested me most. On a trip to Port Douglas in the early 2000s I had purchased a modern, digital video-camcorder. It was not used in Port Douglas on that particular trip, but taken back to New Zealand with me. I had a vague ambition of shooting an art instruction video, since I was somewhat underwhelmed by many I had seen, being of the opinion, that as with other media, 'art' books were, all to frequently, the work of people who 'wrote-books', rather than 'drew', painted or sculpted. I had extensive film/video-making experience, and had, at one time, been President of the Otago Cine Club, during the 1970's, in the years before its slow decline in the face of colour television, and the 1979 'oil-shock'. I had friends in the US, who were very much into the 'Outdoors' and we had compared notes. 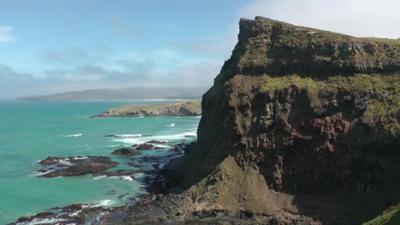 I conceived the idea of travelling south to 'The Nuggets', around 100kMs south of Dunedin for a day's shooting. I had completed what I had in-mind, by 1pm. It was a glorious day, (at the time, that is), and I set out across the cliff-tops, on-foot towards Sandy Bay, some kilometres to the south. By mid-afternoon, I was into the return journey, when I was suddenly enveloped in damp, clammy fog. My return trip involved negotiating my way through several fields guarded by electrified fences, since they were parts of a farm. That had to be done by instinct, memory and 'trial-and-error', which could have had dire consequences. However, safe and warm at home again, the day, in retrospect, had been one of the most enjoyable and inspirational I had spent for a long time. And, on the basis of that trip, undertaken on the 25th of October 2005, I embarked upon my ambitious scheme to visit, with video-gear, the entirety of our Province, Otago's, 250 or so, kilometres of coastline. And, basically, I'm still at-it. But, there is now a difference. The places I visited previously, are getting a second going-over, this time in 'high definition' video, which is a huge improvement on my earlier efforts. Unfortunately, budget restraints concentrate my efforts closer and closer to home, as the price of motor fuel skyrockets. In the last year, I have re-shot and re-edited all footage relating to Otago Peninsula, where we live, the 'almost-an-island' between Otago Harbour and the Pacific to the east. It is a fruitful area for filming. Firstly it is of mainly volcanic origins and a great place to see the 'bones' of nature laid bare, in a geological sense. It is also a haven for wildlife. 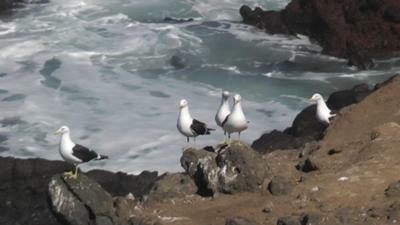 Yellow-eyed penguins ('Hoiho'), fur seals (in near-plague proportions), and sea lions, once wiped out on the mainland, but gradually re-establishing themselves on the mainland from the Sub-Antarctic Islands, are commonplace at this time. The Southern Albatross nests at Taiaroa Head at the harbour entrance, but they, and 'Little Blue' Penguins, have become 'commercialised' to an extent where most New Zealanders 'give-them-a-miss'. During the last six months or so, I have retraced my original footsteps down the length of the Peninsula, invariably on-foot, and with a requirement to visit some places several times. I am aged 75, and reasonably fit, but more than 10kms at-a-time over rough going, while usually possible, is no longer a pleasure, and so I have spread some of my more ambitious trips over several visits. I have established good relations with a number of land-owners by doing the 'honest' thing, and seeking permission for access to remote areas enclosed by farms. That is seldom, if ever, refused once I have made clear my intentions. Occasionally, during the penguin nesting and moulting season, access may be restricted, but penguins are easily stressed, when the loss of feathers causes semi-starvation, because they cannot return to sea, until all feathers have been replaced. Some of my 'days' are 'composites' involving material shot over several trips; others have been accomplished in an afternoon. 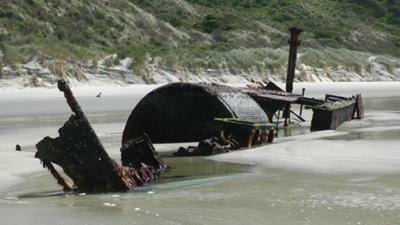 Amongst material I have recorded since 2005, are several shipwreck sites, dating back to 1861. The history of each stranding has to be researched, which sometimes involves the Hocken Library of Otago University, or other agencies such as the Port Chalmers Maritime Museum. The jewel in our crown, if you can call it that, is our music. Anticipating copyright problems, early on, I had belatedly cashed in on the many years of music-lessons which my parents had inflicted upon me as a child, beginning at age six. As a lifetime fan of the musical classics, I had developed an 'ear' for music, but I knew nothing about symphonic orchestration. I read a little from the 'standard' text on the subject, (that of Nokolai Rimsky-Korsakov), but found my ambitions galloping away ahead of my learning capacity; so increasingly, I 'played it by ear' and it has paid off magnificently. Now, video' music seldom breaks down into 'pat' little sequences of four, eight, or sixteen bars, as does more conventional music. Film/Video music, is much more 'fluid'. It has to be, to 'track' the on-screen action and enhance its emotional impact, of-the moment. It was a whole new 'learning' thing which, I must admit, I have not yet fully mastered, but I feel, we are 'getting-there' for all that. Regardless, the music is generally suitable for its intended purpose, but it never makes its way the editor's 'timeline' until I am satisfied that it is as good as I can possibly make-it. One problem with music on my level, is that it is not intended to accompany 'heroic' things, such as the moving around of continental ice as in the BBC Documentaries. The things of my videos are the 'little-things', commonplace, but quirky in many cases. They are not the 'stuff' for bombastic blasts on the French Horns, for example; the music has to have a subtlety about it, and that is much harder to achieve. Currently, with age creeping up on me, I must contemplate a day when I am no longer able to roam the hills at will and so, I work, constantly, to accumulate the footage, (160 DVD's of it, to-date, if I count in, some material recorded in more than one format). That is an investment in a future, when my roamings may be curtailed somewhat, but I still have the capacity to edit the backlog of material, into some semblance of order. All I ask of each day, is that it be 'interesting', which it seldom fails to be. I envision a walk through time if I could see these videos. I am always critical of commercial made films and TV shows where the background music overpowers the dialogue and I cannot enjoy the scene. Somehow these editors feel their talent has to be prominent and is blasted upon the viewer. Many times I cannot enjoy the visual because "background" has become foreground, obliterates even the spoken words. But my comments and complaints are never heeded and the editors continue with their profession and many times dominate a scene. Lately I have avoided TV series specifically because of this dominance of "sound" and instead look for documentaries and travelog type of viewing. My hearing is failing and when background overpowers foreground and I cannot hear dialogue and spoken words, I leave. Click here to return to Your articles.